I have an old Dell Precision 340 workstation with XP Pro 32. I have an old Dell Precision 340 workstation with XP Pro 32. I've been doing housekeeping in preparation for giving the computer away. I had everything cleaned up and ready to go when it started the infamous endless restart problem. I can still get into safe mode so I removed the check mark from "automatically restart" for system failure but get no blue screen, i.e. no report of the problem.I've tried several of the various "fixes" found on the internet but obviously none worked. Click the Startup tab. Select Disable All and click Apply. Then click the Services tab. Select Hide all Microsoft Services. Click Apply>>OK and restart the machine and let me know the result please. Making the changes in safe mode I got a warning that I needed to have administrative rights to make the changes. I rebooted and got to the windows screen where a message appeared that said something about changes having been made to start up using a something, something utility and I should switch back to normal. It would do this only the one time.I'm back in safe mode and msconfig. The changes stuck.One thing I should mention is that as part of one of the "solutions" on line I now have two choices of operating systems, one of which I created/named.Oh, and a few seconds after that message displayed on the desktop it rebooted. Is there only one user account on the machine? I did this in safe mode. Can you now log in as the new administrative user? In safe mode I can of course but the restart happens before there's an opportunity to choose a user in a normal boot. Try restoring machine to old restore points and see if that resolves issue..
Procedure 1 and 2 have no effect. I'm not inclined to use procedure 3. The hassle factor is off the chart.If the computer will boot into safe mode but won't boot normally then the problem lies in the difference between safe mode and normal. Nothing is being loaded except for Microsoft items. SFC doesn't report any bad files. Chkdsk doesn't report any bad spots on the hard drive. I ran the hard disk utility and it passed. So what difference between safe mode and a normal boot would cause a restart? That's it. Windows basic drivers will be loaded in safe mode. That means some third party software is making issue and we have to trace out. I've realized I can get to the desktop for a few moments under one condition. I use a utility named "JV16 Power Tools X". If I instruct the software to compact the registry it will do so just before the desktop appears. The desktop does appear for just a few moments before a restart occurs, displaying the message you see in the attached photo I took will my cell phone.I do have the disc and I can get to the repair screen but to this point I've not had any success in repairing the problem. I am now.No change. I made sure all MS items were checked and everything else unchecked. The repair finished and the desktop is showing. 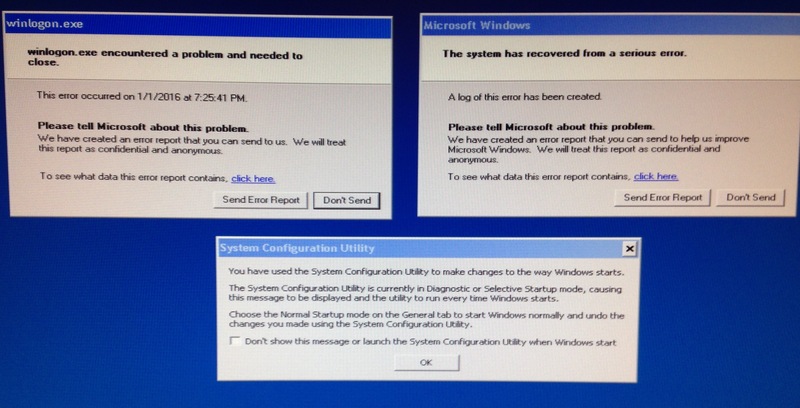 Attached are error messages I got during the process. One occurred as Office 2000 was being/had been installed. Three other errors are still on my screen if I need to do something with them. I get this error when attempting to install Windows Updates or Internet Explorer. Consequently I can't get the updates. Are you able to start that problem computer in Safe mode with networking and are you able to access internet while in Safe mode with networking ? If so, Can I remote onto your Machine and have a look at your problem? It’s fully secure and you can see what I am doing at all times. If you wish please accept my remote support offer and let me know your time zone and the time period you prefer for remote support. Then I can send you the details to connect. Request you to repair the corrupted com+ services on Windows Xp machine..
All that went without a hitch but Internet Explorer crashes. Google Chrome works fine. The installed version of IE is 6 and I could not get it to work. So I installed IE7. More this evening. What's the status of IE after IE7 upgrade. IE won't start. It doesn't show up in Task Manager. More later after work. Would you please download and install IE8 check for issue.. The system on this old computer is 32-bit. So no IE8. I started over with the repair. Now I get a blue screen with data. The image is attached. This old thing isn't work much more of our time. 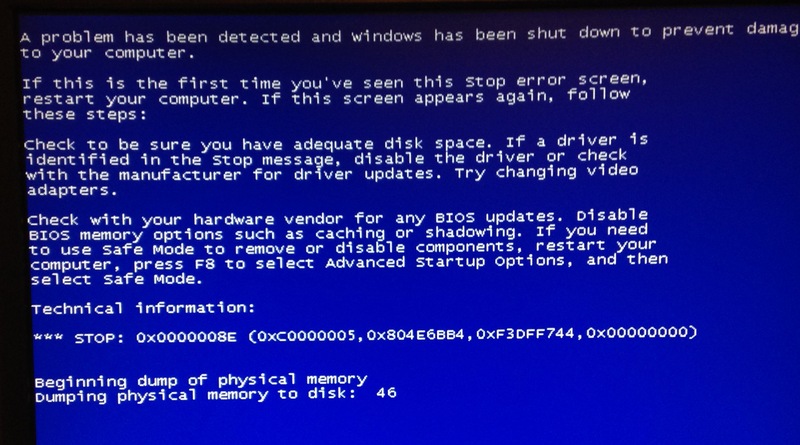 Give me a clue what the blue screen might mean and we'll call it done. Last known good configuration" would get me to the desktop but the computer was unresponsive and a reboot resulted in the previous blue screen message. The "solution" turned out to be installing SP3. IE8 now works correctly. "Windows updates" is functioning. Cross your fingers, we're done.